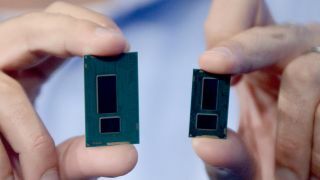 Intel's Broadwell microarchitecture set to debut later this year. The latest Intel CPU is set to ship to partners before the end of the year and we've seen it running. New(ish) Intel CEO Brian Krzanich – or BK as he's known to the Intel engineers we spoke to – showed off the most advanced Intel silicon yet at his first Intel Developer Forum (IDF) in charge. And not content with just flashing up a finished 14nm SoC chip, we also saw it running classic CPU benchmark Cinebench in a testing platform. The previous generation Haswell processors were the culmination of 11 years of hard work designing the tri-gate transistors in order to get down to 22nm. This was what Intel calls the 'tock' - now we're finally seeing the 'tick' of the Haswell microarchitecture shrunk down to 14nm. "This is it, folks," exclaimed Krzanich. "14nm is here, it's working and we'll be shipping by the end of this year." Kirk Skaugen, Intel VP, then went as far as to actually show a Broadwell SoC running in a testing platform with the CPU intensive Cinebench R11.5 benchmark. He wouldn't show us the final score of the four-thread processor, but demonstrated the power levels against an equivalent Haswell SoC running beside it. They were both Y-series parts, the lowest power variants of their generations, and where the Haswell Y part was running at around 6.8W fully loaded, the Broadwell SoC was hitting only 4.9W. "I can show you the benefit of what 14nm is already delivering without a lot of tuning," said Skaugen. "We're seeing it comes to a 30% power reduction at the same performance level just by moving from the Haswell to the Broadwell SoC." "And we're not done yet," explained Krzanich. "That's as far as we've been able to test it. So 14nm is absolutely a reality, it's absolutely coming to a PC near you and we'll see it in product next year." If that sort of power reduction scales up to the desktop parts too, we should hopefully see some fantastic performance improvements when Broadwell arrives in our machines in the spring of 2014. And with that reduction in die size, we're hopeful we'll get even more Iris Pro graphics love with the modular Gen 8 HD graphics. In the meantime, get the full lowdown on the current Haswell generation of the Intel Core processors.